Tourists traveling in a camper pull in for the evening at Castle Butte in the Big Muddy Badlands in Southern Saskatchewan, Canada, where they can admire the beautiful scenic view of the array of hues at dusk. At the Castle Butte lookout, camping is exceptional as the view is stunning and tranquility surrounds you. The barren landscape leaves little for amenities while camping, but in a camper, you have everything you need. The Big Muddy Badlands area separates Southern Saskatchewan from northeastern Montana where a large valley of 55 kilometers, 3 kilometers wide and 160 meters deep in some places, spans the landscape. Castle Butte is located north of the Montana boundary and reaches 200 feet in height with a 1/4 mile circumference. 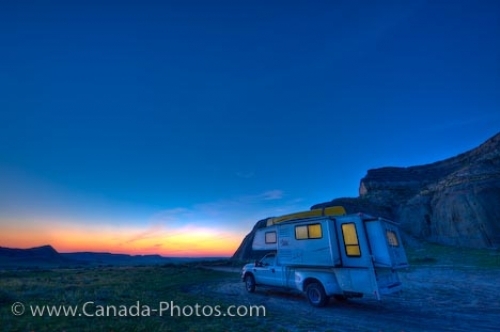 Camper at Castle Butte at dusk in the Big Muddy Badlands of Southern Saskatchewan, Canada.